India is incredible in so many ways. In addition to its diversity in culture, tradition and languages, India is also home to different types of landforms. The travellers from around the world can see the beauty of nature at its best in India. Here the list of 10 of surreal places in India to visit. 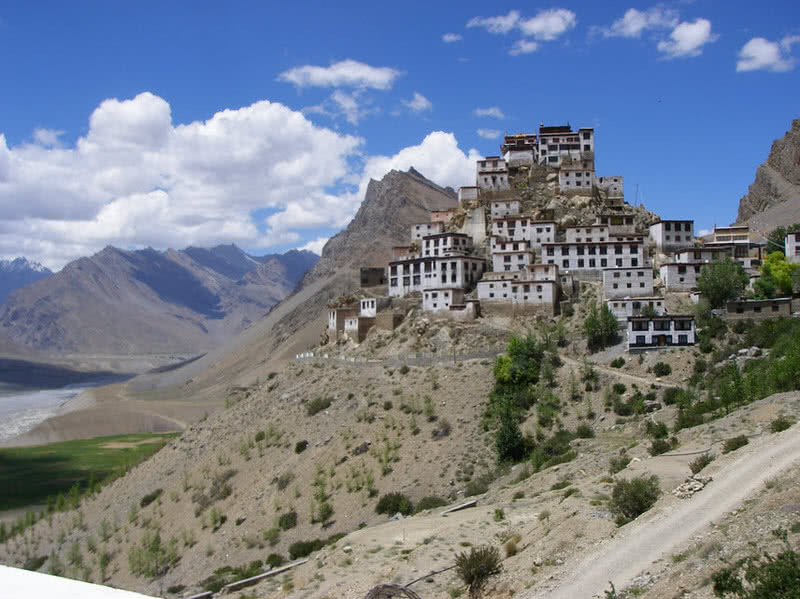 Key Monastery is the biggest and oldest Buddhist monastery in Spiti valley of Himachal Pradesh. It is located at an altitude of 4166 meters above sea level. The monastery has been originally founded by a famous discipline teacher named Dromton in the 11th century. Today it is a home for around 300 Lamas for the religious studies. More than a religious center, the Key Monastery is widely known for its scenic location. The Spiti valley is one of the most beautiful location in the Himalayas. The image of Key Monastery may look like a beautiful painting if you see it for the first time. Because the scenic valley, river and snow capped mountains and the glacier surrounding it seem not to be real. The route to the Spiti valley is also breathtaking. You can see incredible rock formations and beautiful mountains while heading towards the Spiti valley. The atmosphere at Key Monastery is very calm and quiet. It is a three storey building. The ancient murals and weapons are the main attractions of the Key Monastery. It is also home to many incredible images of Gautama Buddha in Dyana position. The majestic Dudhsagar falls is one of most popular and scenic attraction in Goa. It is located in the Sangeum region of Goa, almost 60 km away from the capital city of Panaji. Dudhsagar falls is a series of four different vertical falls. Originated from the high peaks of Western Ghats, Dudhsagar falls have a total height of 310 meters. The Konkani name ‘Dudhsagar’ means ‘Ocean of milk’ in English. You will also feel like streams of milk flowing down the mountain when you see this spectacular waterfalls. Luckily, the South Central rail routes pass just in front of this gorgeous Dudhsagar falls. From the Kulem railway station (near Mollem National Park) you can take a pleasure train journey to Dudhsagar falls. The view of Dudhsagar, when the train crosses the arch bridge just in front of the falls is just breathtaking. 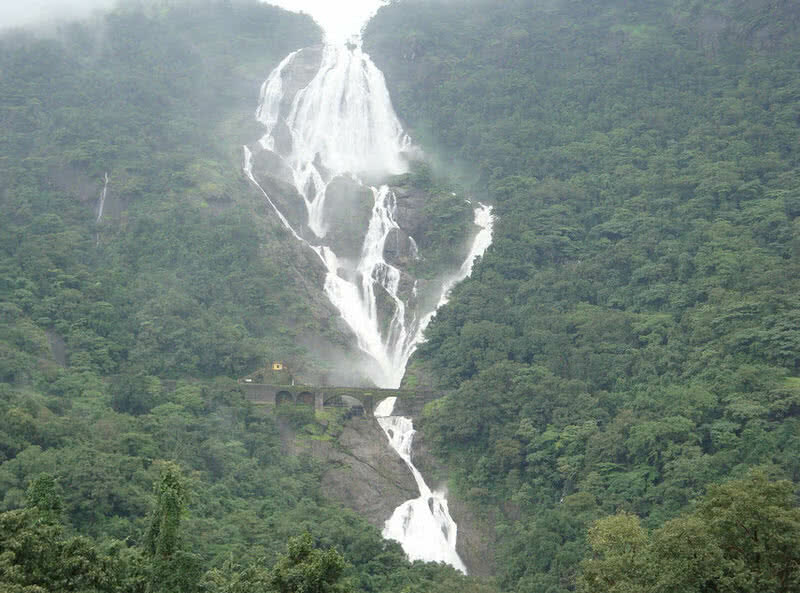 The monsoon season (from June to September) is the best time to visit the Dudhsagar falls. Because the water is in full flow during the monsoon season. You can also hike to the waterfalls along the railway track. While hiking you can enjoy the beauty of surrounding dense forest and old architecture of the rail tunnel built by the British. Andaman and Nicobar islands is a Union Territory of India located in the Bay of Bengal. It comprises 572 islands and only 26 of them are inhabited. Andaman islands have great importance in Indian Independence movement. The cellular jail in Andaman has long been used for torturing Indian activists by the British. Today, both Andaman and Nicobar islands have been transformed into one of most popular tourist destinations in India. There are many reasons to love Andaman and Nicobar islands – the stunning sunsets, beautiful white-sand beaches, world-class diving locations, lush forest and the friendly local people. Throughout the year, Andaman and Nicobar islands receive pleasant mild weather. Port Blair, the capital city of Andaman and Nicobar, is a historically important place and also has many scenic attractions. The beaches of this picturesque town are very enticing. The waters are very clear and have attraction turquoise blue color. Thankfully, some spots are so clear enough to see the coral reefs. You can also enjoy world class scuba diving and snorkeling in the beaches of Port Blair. A century old cellular jail is the another important attraction of Port Blair. Once it served as a colonial prison. During British rule in India, hundreds of freedom fighters were transported to this remote jail. Today the cellular jail stands as a symbol of cruelty faced by the Indian activists by the British. Port Blair – Beautiful beaches, lush forests and a century old cellular jail. Ross Island – A calm and peaceful island. You can see the remains of churches, cemetery and other buildings that were built during British rule in India. Havelock Island – Beautiful white sand beaches, world-class diving spots. Chiriya Tapu – A beautiful small villages with spectacular beaches and stunning sunsets. Of course, India is a land of religious diversity. In this country, people in different regions have different religious beliefs and practices. In such a country, the Golden temple in Amritsar stands as a symbol of the oneness of God. 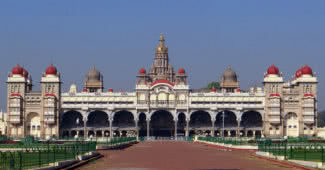 It is the holiest shrine of Sikhs. Irrespective of religion, caste or place of living, people from all parts of the world are welcome here. 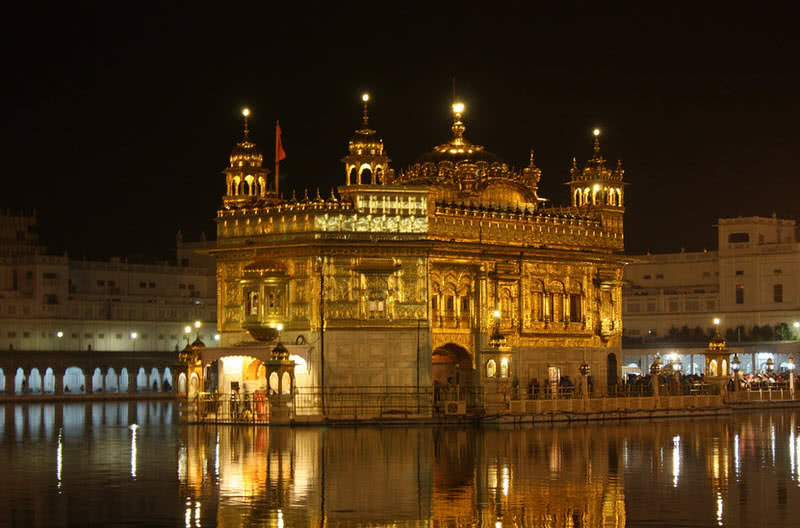 Golden temple is also known as ‘Harimandir Sahib’, which means the temple of God. The Golden temple was constructed between 1588 and 1604 by Sikh Guru, Guru Ram Das. Marble is the main material used for the construction of this temple and it is gold plated with pure gold. This amazing temple surrounded by a man-made lake named Amrit Sarovar. It is said to be the water of this holy lake have special properties. The visitors can be entered the Golden temple from its four different sides. It symbolizes welcoming of people from all parts of the world, irrespective of their religion and cast. Surprisingly, the Golden temple was built on a lower level than its surroundings. So that visitors have to step down to reach the complex. It is to remind the visitors that humility is an important quality to lead a meaningful life. Every day, around 35000 people fed for free at Golden temple. But all participants have to sit on the floor regardless of their religion or caste. This system at Golden temple symbolizes the equality. How it possibly the view of a valley full of beautiful flowers at high peaks of Himalayas? Maybe it seems like a dream. But there is such a majestic valley in the high peaks of Zanskar ranges of Uttarakhand State. 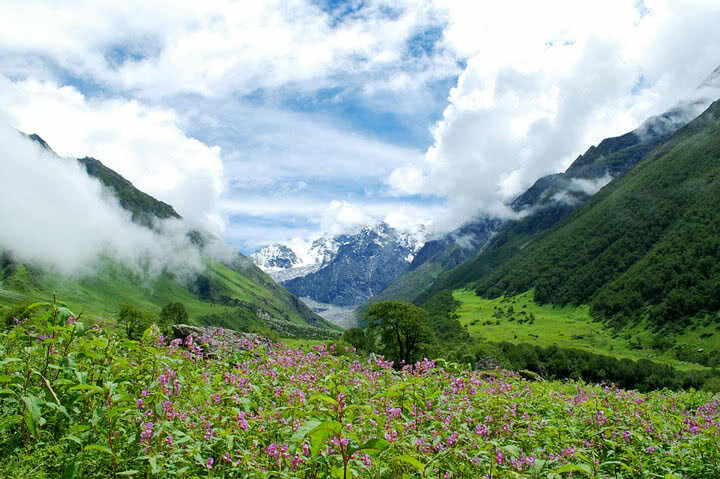 It’s called the valley of flowers, A breathtaking Indian National Park and a world heritage site. In a vast area of 87 square kilometers, this mystical valley is full of beautiful meadows of alpine flowers. The valley of home to more than 500 different types of wildflowers. It is also one of the few places in India that remain unspoiled by the human invasion. Nestled between the Great Himalayas and majestic Zanskar mountains, the valley of flowers is a heaven for nature lovers. June to October is the best time to visit the valley of flowers. During this period, you can enjoy the breathtaking view of this valley at its full bloom. I seem like a colorful carpet spread across a beautiful mountain valley. This magical valley has long been remained unknown to the outside world until the great mountaineer Frank S Smith discovered it back in 1931. You have to climb a 3600-meter high mountain range to reach the valley of flowers, but totally worth it. The Nanda Devi Biosphere reserve, which includes the valley of flowers is a rich wilderness area in the Himalayas. It is home to a number of rare animal species like snow leopard, Asiatic black bear, and brown bear. You can also see beautiful stream and waterfalls on the way to the valley of flowers. Kerala is definitely one of the magical India places that every travelers love to visit. 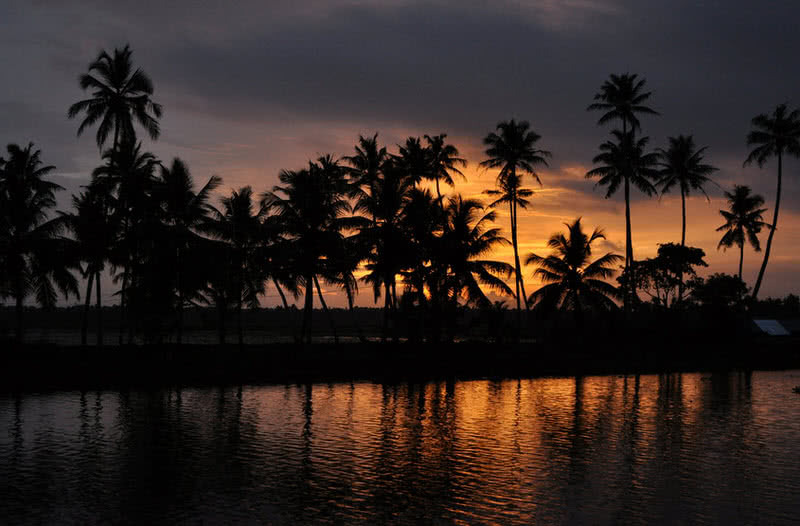 The long stretch of backwaters of Kerala plays an important role in attracting global visitors to the state. With vast networks of rivers, lakes and lagoons, the great Kerala backwaters stretch over 1500 kilometers. Alleppey is an important link in this network. This romantic place has a long network of canals and lakes. Truly, the Alleppey backwaters are one of the fascinating water world on the planet. Among the international tourists, Alleppey is fondly called as ‘Venice of the East’. It is because, just like the Venice city, Alleppey has a vast network of canals. A glide in a houseboat through Alleppey backwaters also brings you almost same experience like the gondola ride through Venice canals. There are many scenic routes to cruise on Alleppey backwaters. As it is a main region of Kerala backwaters, Nowadays Alleppey provide more than 120 houseboats for the tourists. In the banks of the canals of Alleppey, you can see vast expanse of paddy fields. A houseboat cruise along the Alleppey backwaters will definitely be an unforgettable experience for you. Varanasi is a sacred, colorful and fascinating city located in the banks of the river Ganges in the Southeastern Uttar Pradesh. Varanasi is also called as ‘Banaras’ and ‘City of lights’. It is also one of the oldest, continuously inhabited city in the world. Apart from the religious significance, Varanasi is renowned worldwide for its fantastic river frontage. Along the banks of the river Ganges, this city has numerous attractive temples, shrines and palaces. Varanasi truly a paradise for the pilgrims. It is estimated that more than 1 million pilgrims visit this city every year. The pilgrims strongly believe that they can achieve liberation by performing ‘Pujas’ in the river front steps in Varanasi (known as ghats) and bathing in the river Ganges. Varanasi has 87 ghats or riverfront steps in total. Some of these ghats used for the cremation process. In such an atmosphere you will feel more spiritual. The ancient architecture and colors of the buildings in the Varanasi will also leave you awestruck. One such building is Kashi Vishwanath temple. It the most important temple in Varanasi dedicated to Lord Shiva. It is said to be more than 1 ton gold was used for the gold plating of this temple. When you enter the city you can crowded narrow streets. 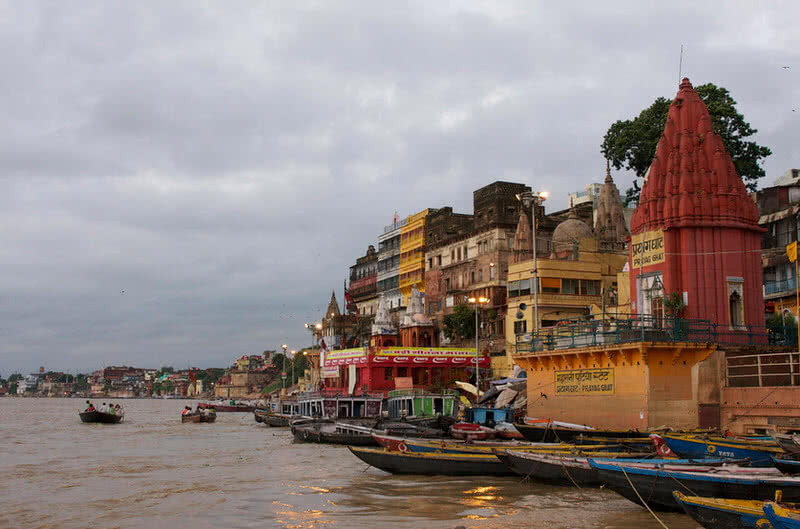 Taking a boat ride along the river Ganges is the best way to experience the Varanasi city. You can also enjoy stunning sunrise and sunset in this holy city. If you are a traveller who seeking for the experience of remoteness and beauty, then the Zanskar valley is the right destination for you. This breathtakingly beautiful valley is located in the Kargil district of Ladakh. Surrounded by snow-capped Himalayan peaks, Zanskar valley is situated at an altitude of 13154 above sea level. It is also the most remote of all trans-Himalayan valleys. The Zanskar trek is definitely one of the most amazing treks in the Himalayan range. The ever changing landscape is the most exciting thing you can enjoy while trekking to the Zanskar valley. Throughout the journey you will see amazing places even though the route is so remote. Another exciting sight you can enjoy on the trip to Zanskar valley is the confluence of the Zanskar River and Indus River. On the meeting point the dirty green waters of Indus River get mixed with the clean blue waters of the Zanskar River. Summer is the best time to visit the Zanskar valley. During winter, the Zanskar river freezes completely and the routes to this valley also get covered with snow during this time. Located between Tibet and Kashmir and surrounded by snow capped peaks of the Himalayas, the Nubra valley is nothing shorter than a paradise. This picturesque valley is located at an altitude of 10000 feet above sea level. The famous Siachen glacier is located to the North of Nubra valley. It is the second longest glacier outside the polar regions. To reach the Nubra valley, you have to cross the Khardung La Pass. At an altitude of 5602 meters, it is the highest motorable road in the world. The attractions are endless on the route to Nubra valley. You can enjoy the view of steep mountain sides, sand dunes, mountain river and unique landscape. 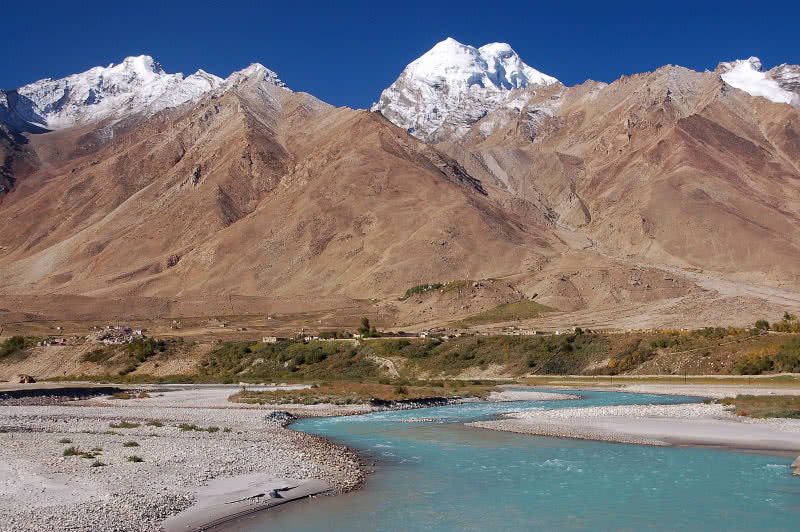 The famous Shyok river and Siachen river also meet at this amazing valley. 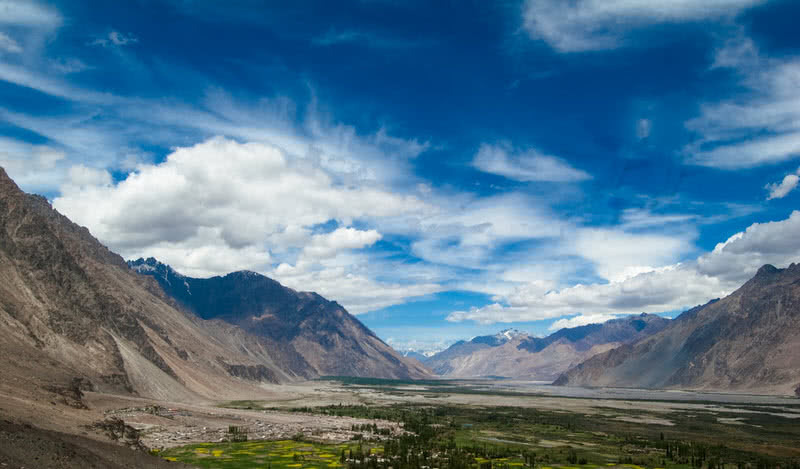 Thus the Nubra valley is truly a blessed place by the nature. The Nubra valley is also known as Moon land, because in winter season this amazing valley looks like a landscape of the Moon. There is also a cold desert between Diskit and Hundur regions of Nubra valley. You can also see sand dunes and double humped Bactrian camels in this desert. Undoubtedly Pangong lake is the most amazing attraction of Ladakh. This insanely beautiful lake is located 160 km Southeast of Leh city. At an altitude of 4530, Pangong is one of the high altitude lakes in the Himalayan regions of India. This amazing 134 km long lake is extends from India to Tibet. 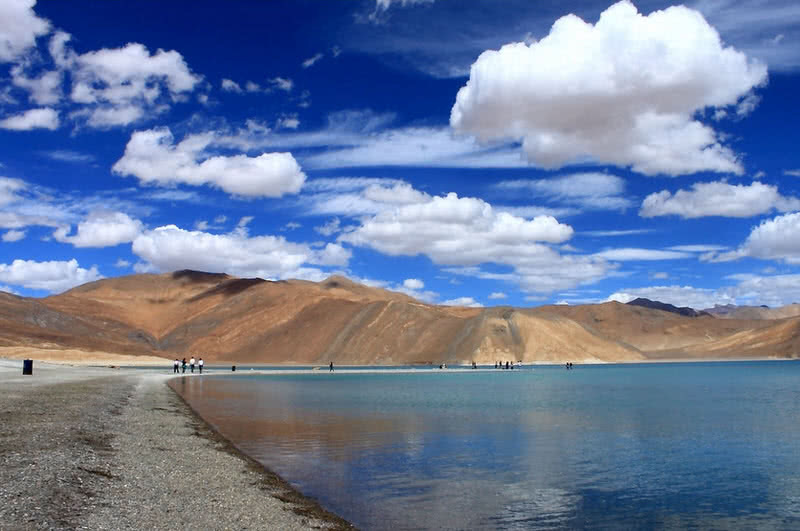 The 60 percentage of the Pangong lake is lies within Tibetan range and remaining 40% lies within the Indian range. This surreal looking lake is globally renowned for its bright blue waters and the scenic surroundings. Surprisingly, the water of the Pangong lake also displays different shades of blue, green and red at different period of time. There is no fish or other aquatic life in Pangong lake due to the saltiness of its water. 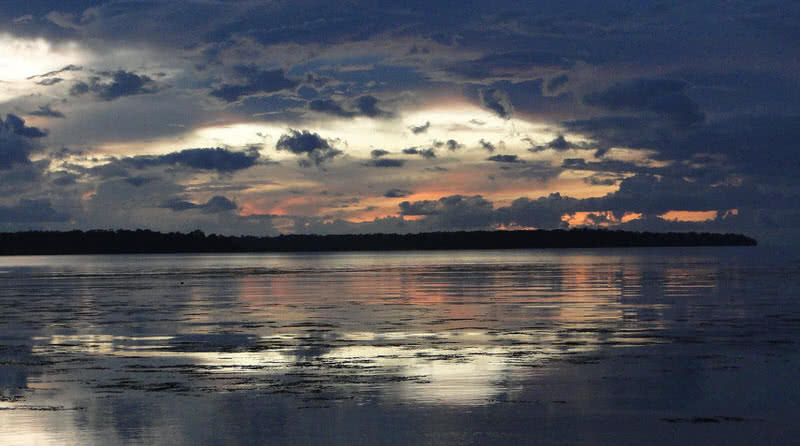 However the lakes receive numerous migratory birds in summer season. Despite of its saline water, the Pangong lake freezes completely in winter. May to September is the best time to visit the Pangong Lake. Apart from its great natural beauty, Pangong lake is also a calm, pollution free place. The route to Pangong Tso is as beautiful as the lake. You have to pass the Chang La mountain pass of Ladakh. It is third highest motorable road in the world at at an altitude of 17352 feet above sea level. On the way you can see scenic landscape and majestic mountains. As you know, each state of India is blessed with many amazing places that attracts tourists from around the world. It may take your entire lifetime to visit all the beautiful places in India. Your list of amazing places in India can be vary from the above list. Please feel free to share the details of your favourite location in India in the comment section below.